Because we prefer to use SARGable operators, grouping related items may be a task that will help some of our queries. One way we can solve this is by adding a new grouping field and using it. However, if we’re required to re-base our identifier, adding a new column will only be part of the solution. One principle in math is to show every step and to make this understandable, we will be doing this in this tip with the help of SQL CTEs, especially with ordering data before we rebase data. We will add one column to our tbOrganicFoodsList table and one column to our tbOrganicFoodOrders table. If we have any dependencies on our primary or foreign keys here, we would first either remove them (drop and re-create script for later) or disable them. Our next step will be dropping the foreign key and then the primary key. Now that we’ve removed our constraints, we’ll begin by adding a column to our tbOrganicFoodsList that will save our identifier field before we re-base it. This will help us avoid column re-naming by creating a new column that’s organized, dropping the old column, and then renaming our new column. That is also an acceptable way to solve this challenge. Our food list with the new column added that we’ll use as a reference. Using a Common table expression named UpdateOrder, in the below code we order the foods alphabetically in our UpdateOrder CTE and call it an UpdateId as well as select our OrganicFoodId, which we’ll be updating to this new order. From our select statement, we can see the new order of our OrganicFoodId versus the OldId. This is a key step if we have old archives on disk backup files or other servers, as this table will allow us to compare the data from our re-based data to our original data, assuming we don’t rebase archived data. Because of this reason, we’ll notice that we save a copy of this table in this step – the saved data is RebasedDataKey_tbOrganicFoodsList. Now, our OrganicFoodId is ordered alphabetically and we see the old order. 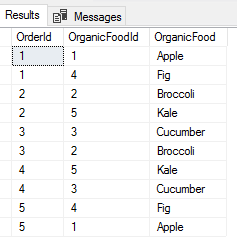 In our next step, we’ll look at our tables joined and see the results of the OrganicFoodId and OldId with the orders that we’ll be using to create a SQL CTE to update the food list. Since I intentionally grouped the orders so that we could perform a quick check, we can see how the new OrganicFoodId that’s been re-based will appear on the tbOrganicFoodOrders table. From here, we use the same join and only select the two OrganicFoodId columns – one from the table we’ve re-based (tbOrganicFoodsList) and the other from the table we’ll be updating (tbOrganicFoodOrders). To make this clear, I’ve titled the column in the SQL CTE to what they’ll be used for – one needs to be re-based (NeedsRebase) and it will be updated and the other is the base which will be the reference point for the update. We then see the update run against this CTE in SQL Server, which updates the appropriate rows of the tbOrganicFoodOrders table. We see the order in our query and we also see how naming in the SQL CTE makes it easy to run an update. Our orders with the new order in place. We have two groups of tables – MS shipped and non-MS shipped and notice our GroupId range of 1000 tables between them.